The sustainable use of resources is critical to a secure and thriving economy. We are working with leading businesses, academics and NGOs to bring about a more resource efficient system, which keeps materials in productive use and avoids the environmental problems caused by waste. 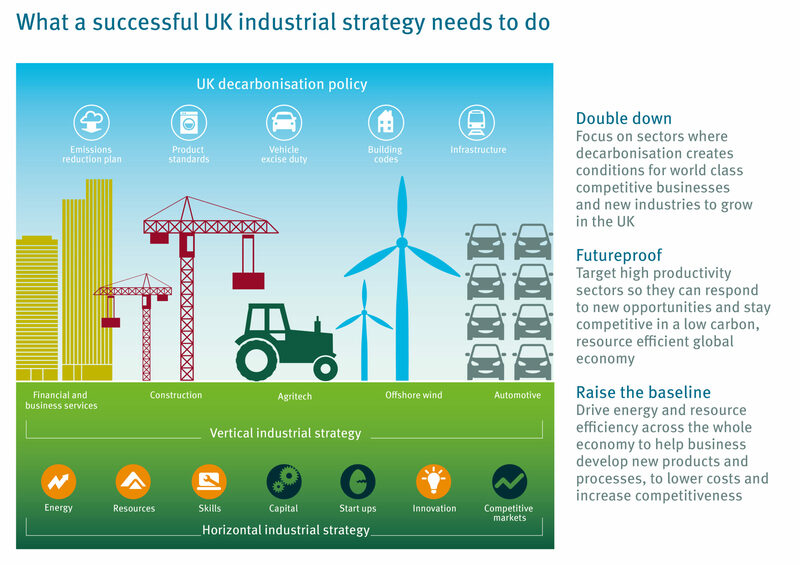 Improving the productivity of resources could save up to 28% of the UK’s total CO2 emissions. Public buy-in will be an important part of the success or failure of innovative proposals to improve resource productivity, so policymakers’ decisions should be informed by evidence on how people are likely to react to specific proposals. In conjunction with the school of psychology at Cardiff University and members of the CIE-MAP consortium, Green Alliance are working with key decision makers to ensure policy on resource productivity is fully informed by the evidence on public attitudes and engagement. In Less in, more out: ​using resource efficiency to cut carbon and benefit the economy we demonstrated that resource efficiency is a major new tool for climate policy and that improving the use of resources in five key sectors could make a major contribution to meeting future carbon targets. Building on this work, our latest publication, By popular demand: what people want from a resource efficient economy, shows which strategies will be most popular with the public. It is rooted in the belief that a successful transition to a low carbon, material efficient economy will only be possible if businesses and government design policies that people accept. Marine plastics What happens to plastic in the sea and how do we stop it getting there? What happens to plastic in the sea? The Circular Economy Task Force is a business group convened by Green Alliance. It is a forum for policy, innovation and business thinking on resource use in the UK and is currently chaired by Colin Church, chief executive of IOM3. The Task Force's first report, Resource resilient UK, identified the barriers to business becoming more resilient, profitable and sustainable through better resource productivity, helping the UK to increase its resource security. Its second report, Wasted opportunities, shows how addressing the UK’s broken recycling system can foster higher value reprocessing, and begin to encourage more valuable remanufacturing and redesign. Its third report, UK resource governance for the 21st century, highlights the risks the UK's poor performance in improving resource security and productivity poses to businesses, and analyses potential solutions. Its fourth report, Recycling reset: how England can stop subsidising waste, shows there is an opportunity to rethink the household recycling system and provides recommendations to guide a new policy for England. It's fifth report, Lean and clean: building manufacturing excellence in the UK, proposes a manufacturing upgrade programme to support businesses in raising their resource efficiency, to help close the north-south productivity divide and to keep good jobs in the UK. Its sixth report, A new direction for UK resource strategy after Brexit, looks at how Defra can manage the divergence from existing EU waste and resource governance and create new policies after Brexit. Its most recent report, Completing the Circle, highlights that, once collected, materials are often lost to the economy, and proposes new measures to complement recycling targets which would help to 'pull' these materials back into use in manufacturing. The Task Force is continuing to research the policy solutions that would enable businesses to make the necessary changes for a more circular economy, optimising the UK's resource use. Some of the recommendations of the Task Force were picked up by the UK’s Environmental Audit Committee’s Growing a circular economy report, and by the Scottish Government’s Resource Use and the Circular Economy inquiry. The task force has also established the North Sea Resource Roundabout project, working with the Embassy of the Kingdom of the Netherlands in the UK to identify the regulatory barriers to the trade and use of recycled materials across European countries, and working with regulators to develop solutions. We have also published the infographic, The social benefits of a circular economy: lessons from the UK, which demonstrates the social benefits of a more circular economy and how EU policy can help to deliver them, as well as the policy insight, A new direction for UK resource strategy after Brexit, which looks at how Defra can manage the divergence from existing EU waste and resource governance and create new policies after Brexit. The current members of the Task Force are Kingfisher, Viridor, Walgreens Boots Alliance, SUEZ recycling and recovery UK, and Veolia. Our 2015 report, A circular economy for smart devices, identifies how laptops, tablets and smartphones, which are up to five years old, can be profitably recovered and resold in the UK, US and India. It shows that this would have major environmental benefits: just keeping a smartphone in use for one additional year cuts its lifetime CO2 footprint by 30%. The report describes six business models that companies can use to design more circular electronics. Doing so would meet consumer preferences for lower cost, longer-lasting electronics, and help bring the benefits of internet connected devices to new consumers in the developing world. Our 2016 analysis, The end of the upgrade? looks specifically at O2's experience in adapting to a circular economy. It provides new evidence that SIM only customers are using their phones for longer, nearly six months more than four years ago, which is helping to cut annual carbon emissions significantly. We recommend a number of innovative schemes that companies can implement in order to create more circular business models. There are also steps that governments can take to encourage companies to implement these models, the most immediate opportunity being for the EU to extend the Ecodesign Directive. Our 2016 study, Better products by design: ensuring high standards for UK consumers, provides further analysis of the durability and repairability of smartphones. Research by economists at Green Alliance and WRAP has demonstrated that, if Britain continues to develop its circular economy sector, it will help to solve some underlying issues in the labour market, creating net jobs in regions where unemployment is high, such as the North East and West Midlands, and among low- to mid-skilled occupations, where a higher rate of job losses are projected. Using the same methodology, we have also quantified the job impacts of circular economy development on the very different labour markets of Germany, Poland and Italy. Read our briefing, Job quality in a circular economy, to find out more about how job satisfaction can be achieved in a circular economy. Our report, Unemployment and the circular economy in Europe, was cited in a 2015 briefing to the European Parliament following the controversial axing of the Circular Economy Package in 2014, and used publicly as a benchmark of the ambition of the 2015 Circular Economy Package which has recently been agreed. Our 2015 report, Circular economy Scotland, shows how Scotland could help to make its economy more circular, by assessing potential opportunities in three exemplar sectors, and developing these into a wider suite of lessons for government as a whole. It shows how new biorefineries could convert byproducts from the whisky industry into feed for the salmon farming industry, raising the value of these byproducts and reducing demand for wild-caught fish. It also identifies how the offshore oil and gas industry could go beyond recycling of offshore infrastructure, and enable both reuse and carbon capture and storage. The analysis draws on Green Alliance’s experience of working with the businesses in the UK’s Circular Economy Task Force and a programme of engagement with the businesses and political actors in Scotland’s oil and gas, food and drink, and finance sectors, which we undertook with the Scottish Council for Development and Industry (SCDI).